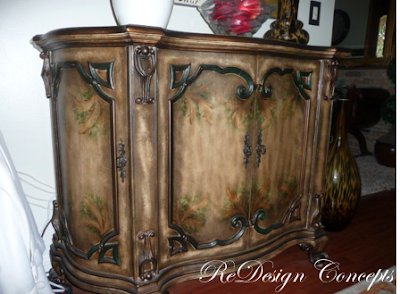 ReDesign Concepts Blog: Weekend Project - Buffet Transformation! 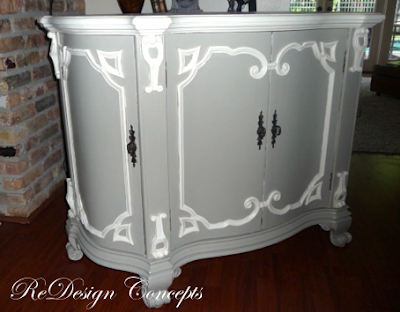 Weekend Project - Buffet Transformation! Have you ever wanted a new piece of furniture for a room you were redesigning but didn't want to spend the money? Well, you do have another option. The best place to start is by 'shopping' right in your home. 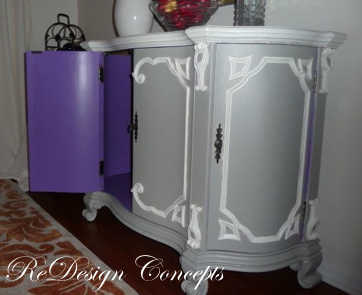 Chances are you will find something that you could use but it may not be the right color or style. Not to worry...it can easily be transformed with a little paint. I needed a 'new' piece of furniture for my newly redesigned dining room and or course using what you already have makes perfect sense. 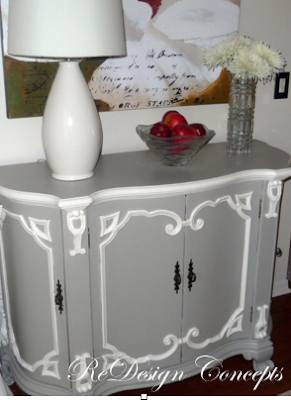 Continuing my quest to lighten and brighten things around the house, this buffet was next on my hit list. So I spent a few hours and a few dollars and transformed my buffet. Because it was going in the 'new' dining room, I was looking for more of a transitional style (traditional with a twist) to better fit the space. I saw this little idea (below) from Mr. Goodwill Hunting on the The Nate Berkus Show....paint the inside of a piece of furniture an unexpected pop of color....sort of a little surprise when you open the door. 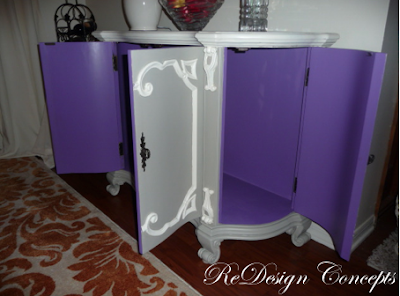 I like the purple/gray combination and love this bright color so I painted the entire inside of the buffet. And, voila'!...my weekend project was complete and it really didn't take the entire weekend...more like just a few hours! I now have a completely 'new' piece of furniture with the look and style I want for only a few dollars!